Los Angeles trimmed some of the fat by trading Yasiel Puig and Matt Kemp to the Reds. This made some think Harper was incoming, but the fact is they were overloaded at outfield. They signed A.J. Pollock, and found out Cody Bellinger plays an above average center field too. Either way this lineup is loaded again. Corey Seager is on his way back from injury, as he missed 2018. The addition of Pollock is going to give them a great leadoff bat to put in front of names like Bellinger, Max Muncy, and Justin Turner. They lost Yasmani Grandal, but Austin Barnes will jump unto a more solidified role. This offense started off slow in 2018, but when they get hot, they can compete with anyone on offense. Expect loads of power from this bunch, especially from Pederson, Muncy, and Bellinger. The Dodgers finished with the second best ERA last season, and has had a plus rotation for quite some time. Los Angeles will go into 2019 with everyone healthy, but there will be no more Alex Wood within the rotation. The Dodgers shipped him out to Cincinnati. The Dodgers won’t miss a beat, as they have Julio Urias and Hyun-Jin Ryu as two lefty options that will likely split the innings given up. Urias is a talented left-hander who missed most of 2018 with an injury. Urias has a big career ahead of him, and 2019 should be where we start to look at his career. Ryu was very successful in 2018, boasting a 1.97 ERA and averaged a strikeout per inning. 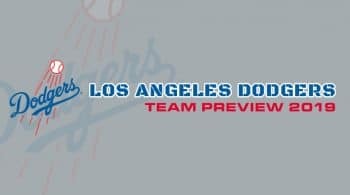 They are going to have some depth for the rotation, which is big with Rich Hill and Clayton Kershaw hitting the DL more often the last two seasons. They also have Ross Stripling, who started about half the season. He ended up with a 27% strikeout rate and 2.99 xFIP. He will likely head back to a bullpen role, but he is just another piece that adds to guys who can fill-in or injured starters. Walker Buehler really broke out after blowing through the Minor Leagues. Buehler has a blazing fastball, and it set up some strong off-speed stuff. Buehler had a 2.62 ERA and 151 strikeouts in 125 innings. Being a younger arm, the Dodgers will likely keep him fresh, so expect some of the younger arms to cut into each other’s workload a bit. This might just be a theme for all arms. Kershaw has been trending downwards with his velocity and the back is also something to note. Hill has always had blister issues, and of course he is 39 years old. We are in the midst of watching the Dodgers rotation transition into the new young ace pitchers. Kershaw and Hill are still a strong duo, but we will need to keep an eye on their concerning trends. Overall their 2018 stats, both finished with above average strikeout stuff, and a strong ERA. Los Angeles should continue to boast one of the best rotations in baseball.